Some inventions are so silly that they are not even entitled to carry the name given to them by their inventor. 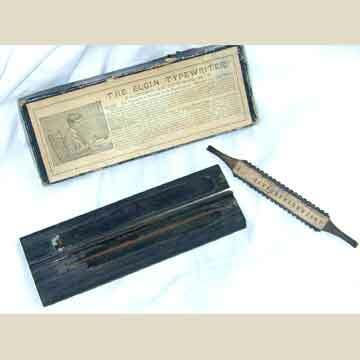 A good example is this 'typewriter' invented by Frank Felt and patented in Aubust 1889. Felt described this gadget as a 'new and useful writing machine'. It was certainly new, but its usefulness can be debated. There are two variations of the cardboard box know: one with the figure of a man using the Elgin, one without. The box measures 7.5" by 3" by 1" tall. The typewriter was originally sold for 1$ (to be sent to Tiffany Mfg.Co., 25 Waverly Place, NY), but after a brief period dropped to 60c or two for 1$ (to be sent to Novelty Typewriter Co., Oswego, NY), but even this price was too much and they ended up giving it away for free to the new suscribers of "The Home Circle" (magazine).